MERCATOR,G./ HONDIUS,J. - Lacus Lemanus. Lacus Lemanus. - MERCATOR,G./ HONDIUS,J. Size : 5.5 x 7.7 inches. / 14.0 x 19.5 cm. 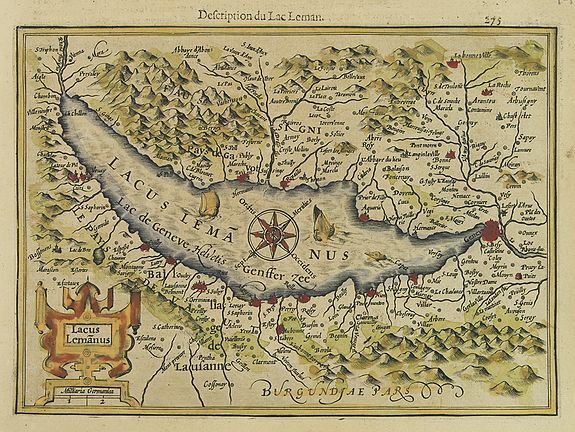 Description :Excellent example of Mercator?s close-up map Lake Geneva and surrounding area. North is at the bottom. Several old place names have been retained today. Strap work cartouche. From the first French-text edition of Jodocus Hondius'' Atlas Minor. Condition : Some browning of paper. Dark impression.